On Thursday, I woke up in Syracuse, New York, and traveled back to San Diego (6 hours of flying). On Saturday, we flew from San Diego to Kahului, Hawai’i (6 hours of flying). 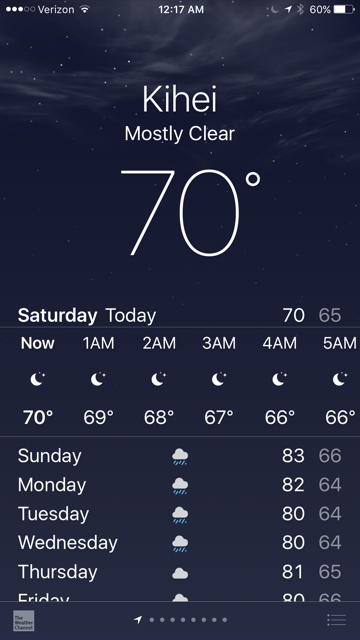 I am glad I am not in Syracuse anymore. 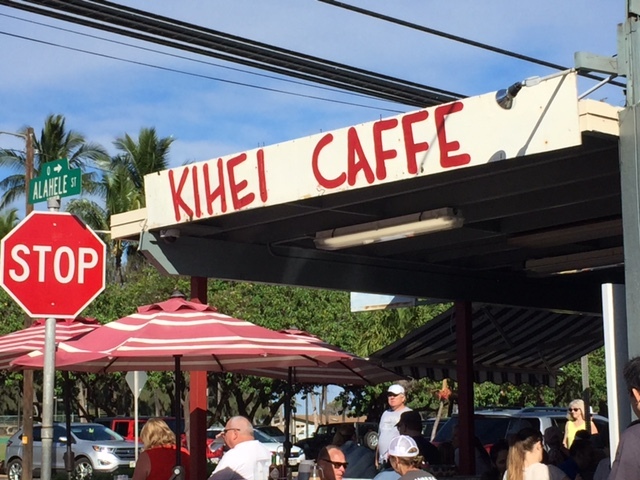 Breakfast at the world-famous Kihei Caffe, a real dive by the road, only takes cash, but there is always a line out the door. When we were last on the Big Island of Hawaii, there is a little town called Kapa’au, where I spotted an art gallery as we drove through. We met the artist and we talked for quite a while about his work. Then we exchanged addresses. Today, this big box came in the mail. The artist has sent a signed copy of his 250 page hardcover coffee table book full of his art. How many art galleries have you ever stopped in and then received the artist’s book with his life’s work in it in the mail? I am honored! 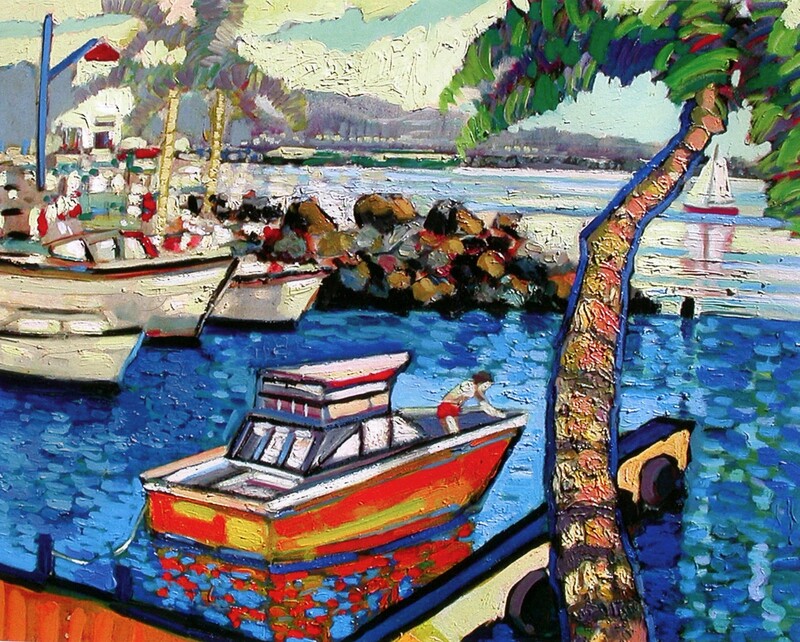 Make sure that if you ever go to Hawaii, drive up to Kapa’au, where you can see Maui looming in the north on a clear day, and where Ackerman’s gallery, full of bright and inspiring paintings, is open to visitors. If you are really lucky, you might even meet the artist. 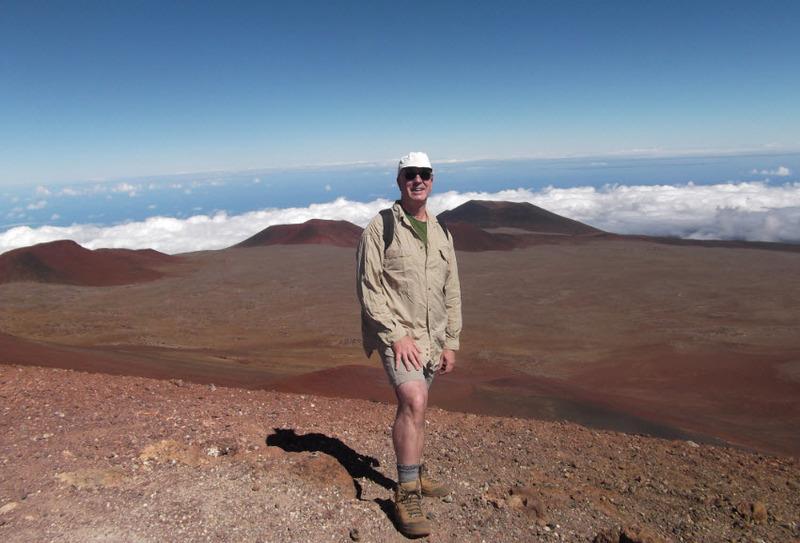 I knew that I didn’t have time to hike up Mauna Kea, so I planned only for an exploratory hike. Mauna Kea means white mountain, because in the winter it is snow-covered. This is the highest mountain in the Pacific (and in Hawaii) at 13,803 feet. Since 17,000 feet of the mountain’s base is also under water, it is often credited with being the largest mountain on Earth, rising over 30,000 feet from its base, which is twice that of Everest. 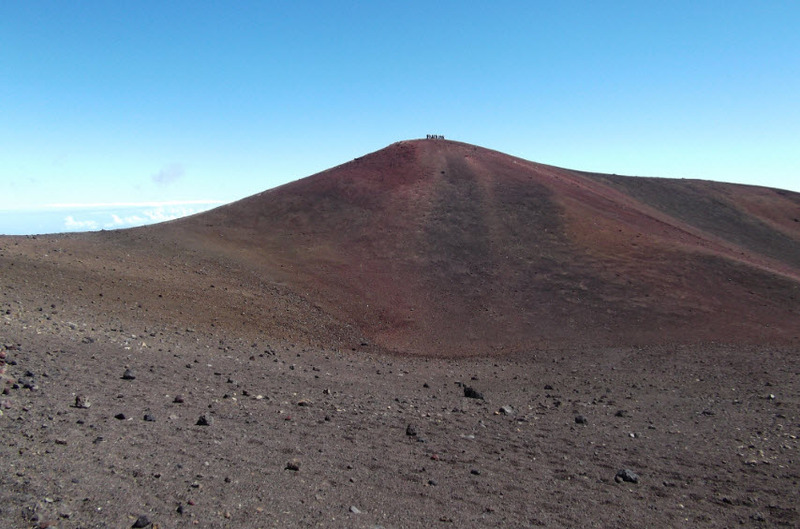 However you look at it, hiking Mauna Kea is not for the faint of heart. I just drove to the visitor center, about six miles from the Saddle Road, at 9,200 feet, parked my car and hiked about 1,000 vertical feet up the trail just to explore – so I’d know what to expect next time. This picture shows what it looks like. 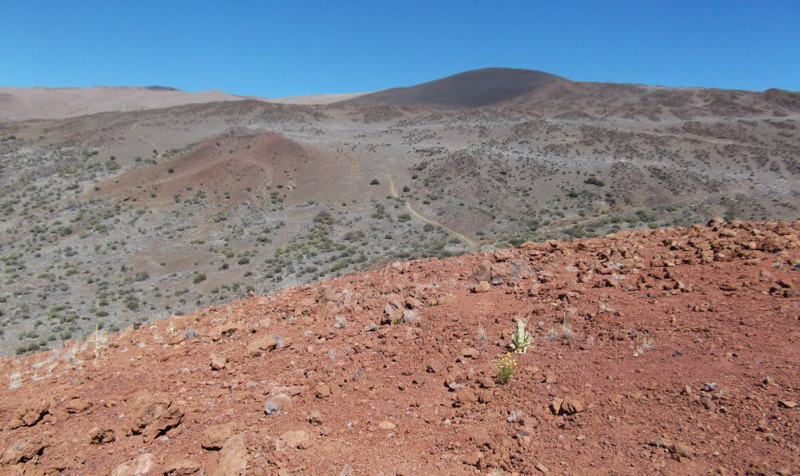 Completely barren, moon-scape-like cinder cones of red lava is all there is on this mountain. In the center of the picture you can faintly see the trail, going up and curving to the left behind the cone in the left center. The top of the picture is not the peak – that is much further behind. The road is not paved all the way up. 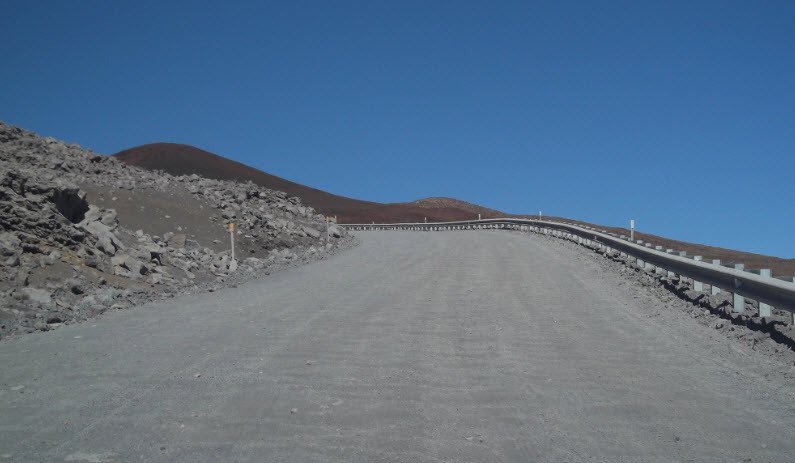 The first six miles to the visitor center from Saddle Road is paved. Then comes a section of five miles of gravel road, followed by another four miles of pavement at the top. This picture shows the gravel road. 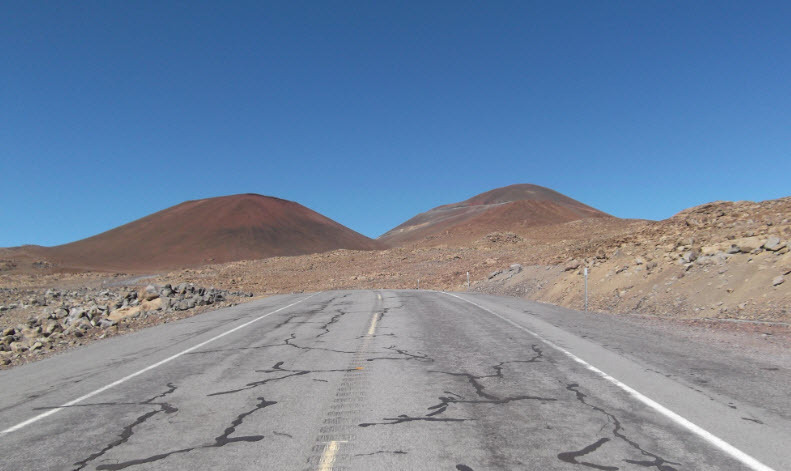 The road is badly washboarded, and on the right side it’s quite sandy, particularly at the steep sections. I drove a regular sedan. I only got stuck once when it was steep and I went very slowly. My front wheels started spinning and the car drifted to the right. I had to back down gently to a better spot, pick up some speed and race over the steep part. After what seemed like endless dirt road, I finally reached the welcome pavement. You can see the road snaking up the right cone. That is still not the peak, but I am getting close. Finally at the top. The peak in front is the top of Mauna Kea. I hiked along the ridge on the left. Up on top (you can click to enlarge) is a youth group chanting in native Hawaiian. Once I got there I joined and listened to their stories. Here I am standing on the very peak – the roof of the Pacific. Other than the other Hawaiian Islands, it’s many thousands of miles in every direction to the nearest land. At almost 14,000 feet, I am very light-headed and clumsy, and unsteady on my feet. Humans are not designed to go from sea-level to 14,000 feet in a few hours. I was lucky that is was a warm day. The high on the mountain was 52 degrees. 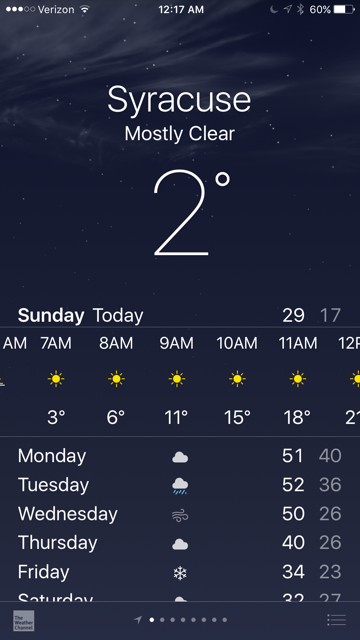 I didn’t need the down jacket I had brought for the occasion. It can be zero degrees and blizzard conditions up there within a few hours of nice sunshine. I was lucky, and I had great, clear views in all directions. This is the view east. Down below those clouds is the city of Hilo. Looking south, in the distance, is the massive mountain Mauna Loa (black mountain), only a hundred feet or so lower than Mauna Kea. This is the largest volume of mountain in Hawaii. 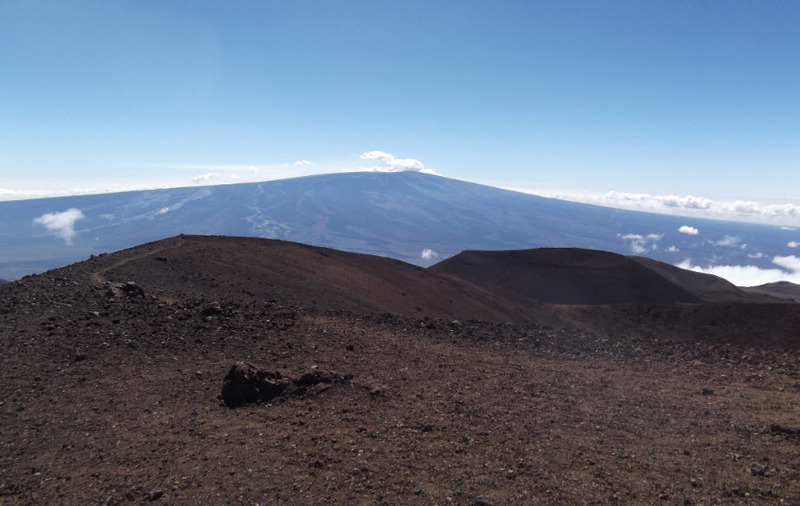 It is said that the landmass of Mauna Loa is bigger than that of all Hawaiian Islands combined. 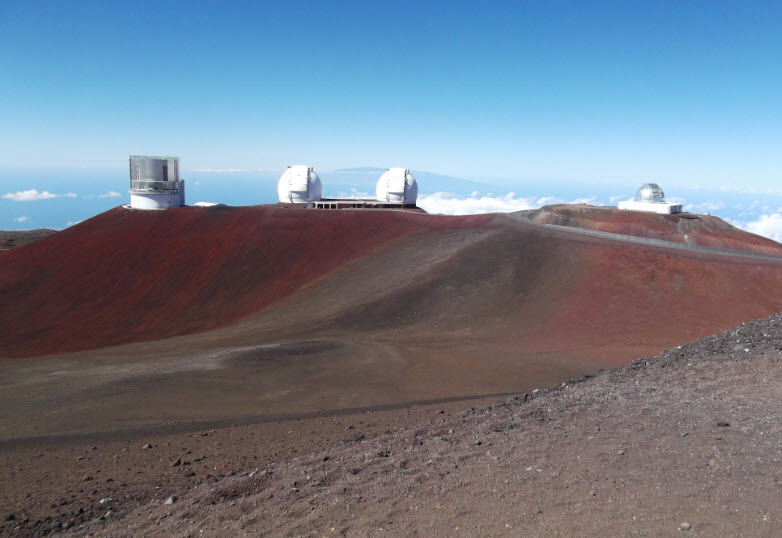 Its broad expanse is awesome, and the top of Mauna Kea is one of the few places where it is possible to even see the entirety of it. 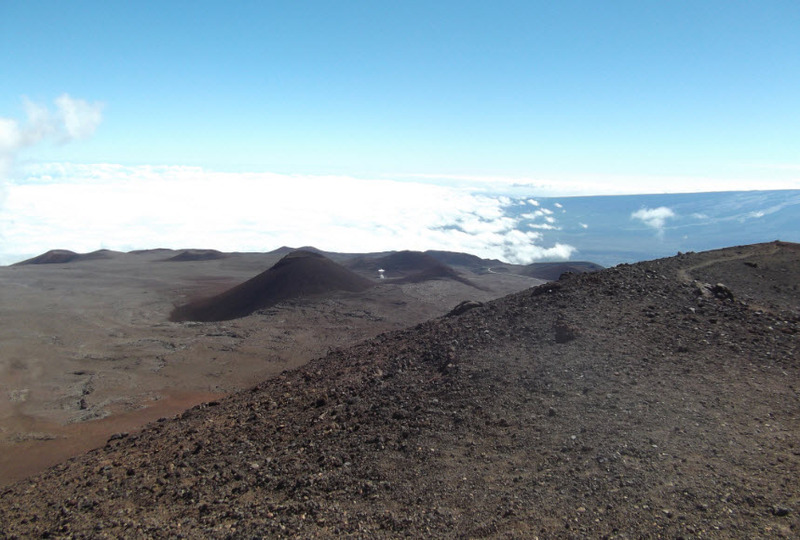 You can see the peak of Haleakala between the two domes and the island of Maui stretching all the way to the right edge of the picture. 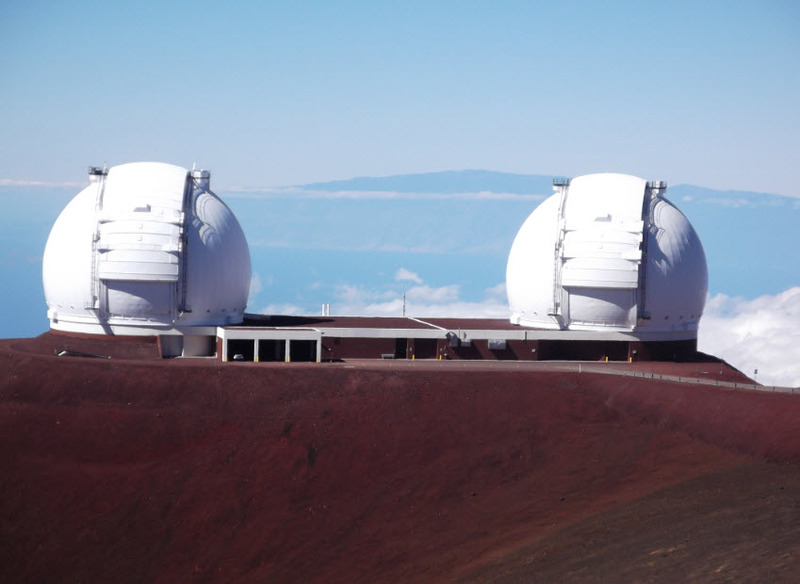 Mauna Kea is an impressive mountain and an experience. The native Hawaiians don’t think of it as a mountain, they think of it as their ancestor. I need to come back when I have a full 8 – 10 hours to do the round-trip hike so I can feel its soul. The Hawaiian islands were formed by a single hot spot under the Pacific that has been spewing lava for tens of millions of years, while the Pacific plate is moving from east to west. The oldest of the islands are toward the west, the biggest one remaining is Kauai. There are older islands west of Kauai, or remainders of islands, all washed back to the sea. Kauai is 5.1 million years old. That’s all. Oahu is 3 million years old. Maui is 1.32 million years old. 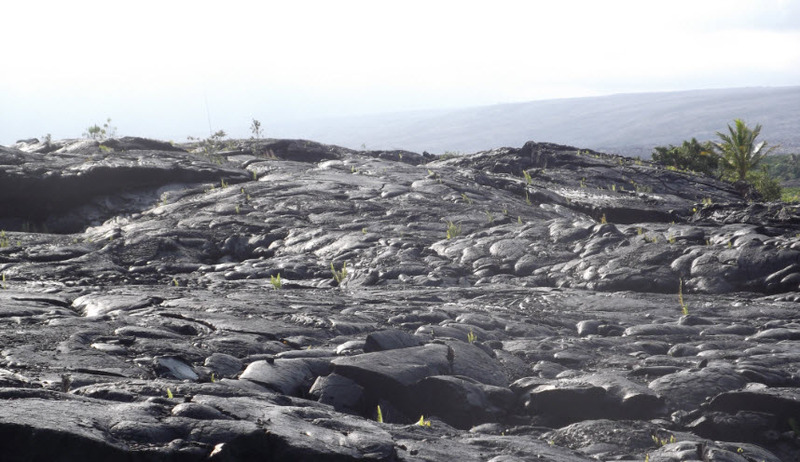 The Big Island is only 400,000 years old. The volcano Kilauea is the most active volcano in the world. It is flowing right now. Yesterday we went down to the current lava flow and walked on land that did not exist eight years ago. Eight years ago. For me nothing brings the transient state of the world to life as powerfully as a visit to Hawaii. I can see the world changing in front of me here. 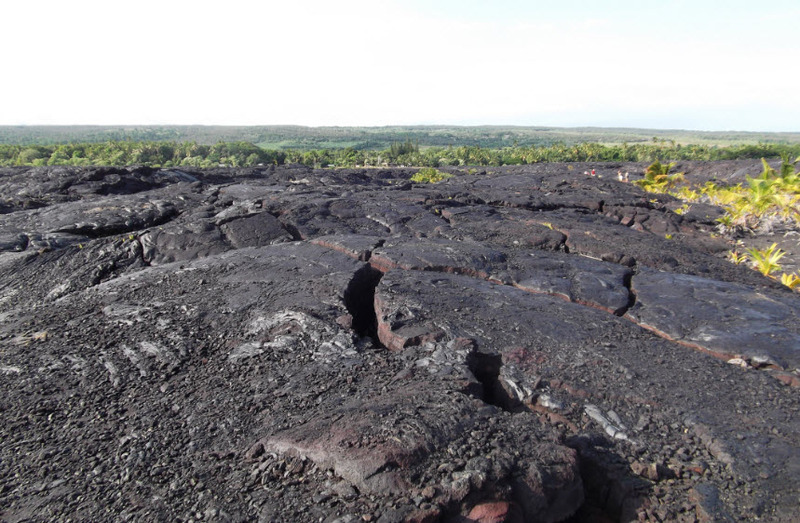 Here I was standing on the land created from lava flow only a few years ago. I was looking back toward the Kilauea volcano in the background, in the mist. This is where all this lava I am standing on came from. 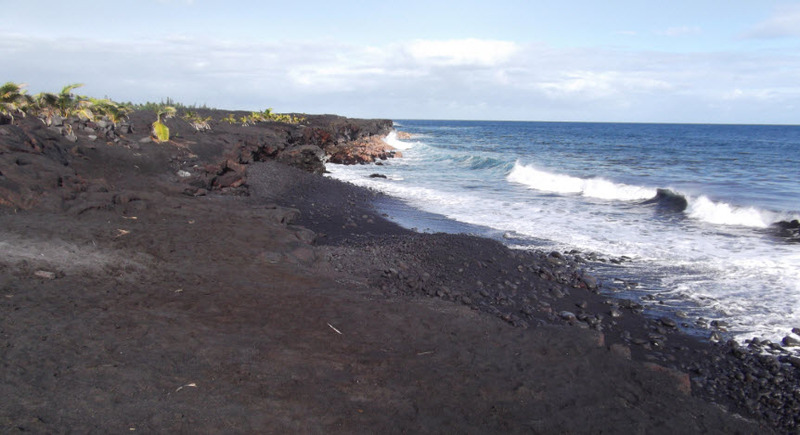 A quarter of a mile out toward the ocean, there is a new “beach.” It’s all black, course sand from ground-up lava. Coconuts start sprouting in the background. 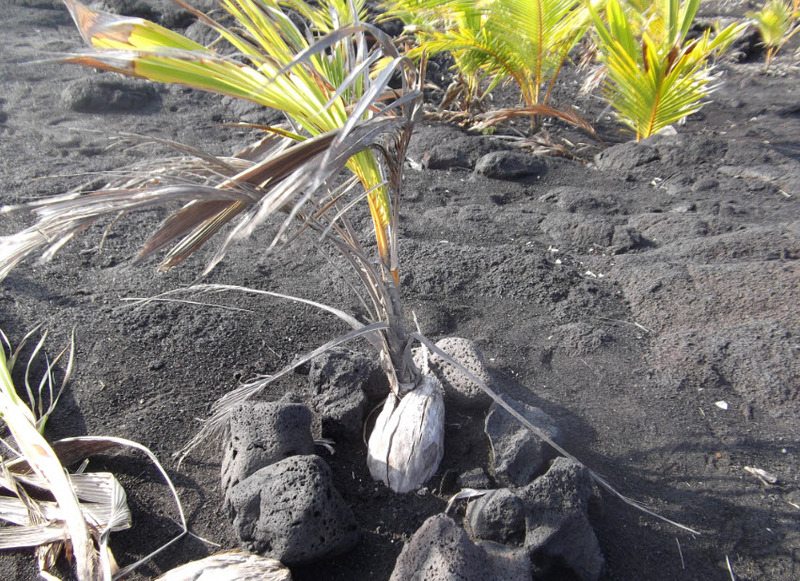 Humans, of course, help nature along, bringing coconuts out to sprout on the new land. I looked for a high point in the lava fields and looked back toward the old coast. The green stripe on the top of this photograph is where the old coast line was. There was a road, shops, houses, and a nice, sandy beach, not many years ago. 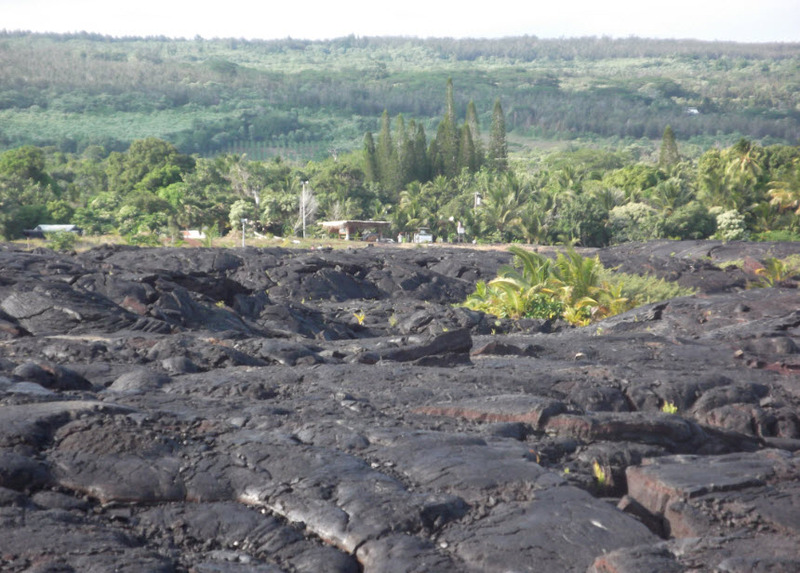 Now there is nothing but new lava, and the beach moved at least a quarter of a mile away. Here is a zoomed look to the old coastline. Somehow, when the lava came, it flowed down parallel to the coast into the ocean and it spared these shacks, houses and the jungle behind them. But nature (or the volcano god Pele) could change its mind tomorrow, and wipe all that out. Some half a million years from now, when the Big Island of Hawaii is washed down and separated into three individual islands, some hotel chain may create a resort on this beach, and a new island may loom to the south of it, an island that does not exist yet, but is growing from the ocean floor right now. Humanity is fortunate to be able to stand here and watch this spectacle of geology during our civilization, nothing but the blink of an eye in geological time scales.